EWTRA is featuring the newly launched The Macallan Rare Cask Black throughout December in the Rotunda at Mexico City Airport with Dufry. Edrington WEBB Travel Retail Americas (EWTRA), closing in on its one year anniversary in January, is ending 2015 with high profile activities for its brands in some of the most important airports in the region. Its strong spirits portfolio features such important brands as Macallan, Tito’s Vodka, Disaronno, and Licor 43, all of which enjoyed major presentations over the past few months. “We started the business in January and, coming up on our one year anniversary, we took off very well. We have the saying ‘We’ve refurbished the boat. Now we need to get it to start moving faster.’ You are seeing the fruits of all that work now with all the displays and the special programming,” says Andy Consuegra, EWTRA CEO. Launched in October at the TFWA World Exhibition in Cannes, Macallan Rare Cask Black will be one of EWTRA’s main focuses at the end of 2015 and in 2016. 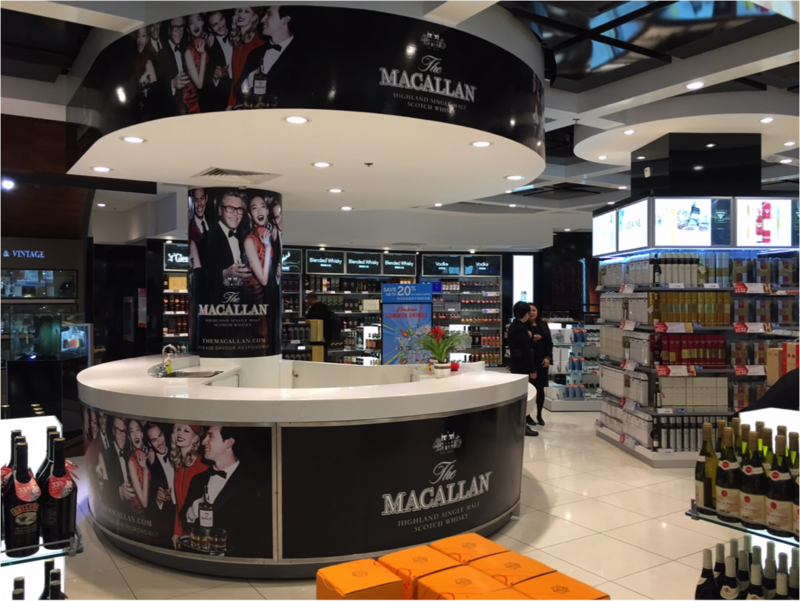 Starting in December, Macallan Rare Cask Black was featured at the rotunda in Mexico City Airport operated by Dufry. 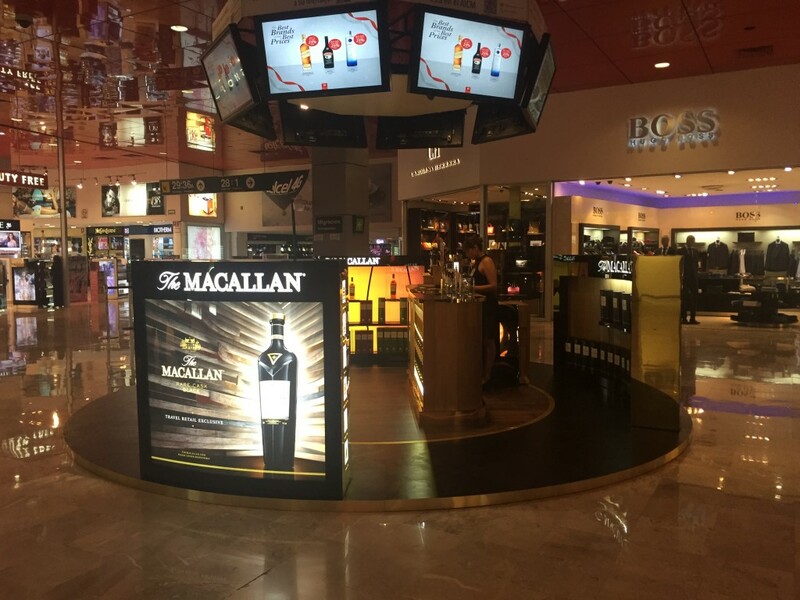 “We are staging a huge month-long animation at the rotunda in Mexico City right in front of Dufry’s main Terminal 1 store, featuring the launch of Rare Cask Black with tastings, says Colombo, adding that EWTRA has high expectations for Macallan Rare Cask Black. Macallan Rare Cask Black helps build the TR exclusive 1824 Macallan range, explains Colombo. Education is key to the success of a brand like Rare Cask Black, says Colombo, and EWTRA has trained more than 700 sales staffs throughout the region in the first part of 2015. “We are out all year making sure that we get the message across, that we give the sales staff the right tools to communicate at the point of sale. Information is critical. When a customer asks ‘how old is it?’ the staff need a quick way to explain that it is not about the age, it is about the maturity, the profile, the taste, etc. People are willing to be educated, and are more willing to try new things as long as you give them information and tell the story, and explain why this product is worth the cost,” says Colombo. EWTRA featured a tasting bar for Macallan and Highland Park at Vancouver International Airport in October. “The consumers see Macallan as a luxury brand. They know with luxury that the quality is going to be there. They like the different expressions and appreciate that in duty free they get something that they can’t get in the local market,” says Consuegra. 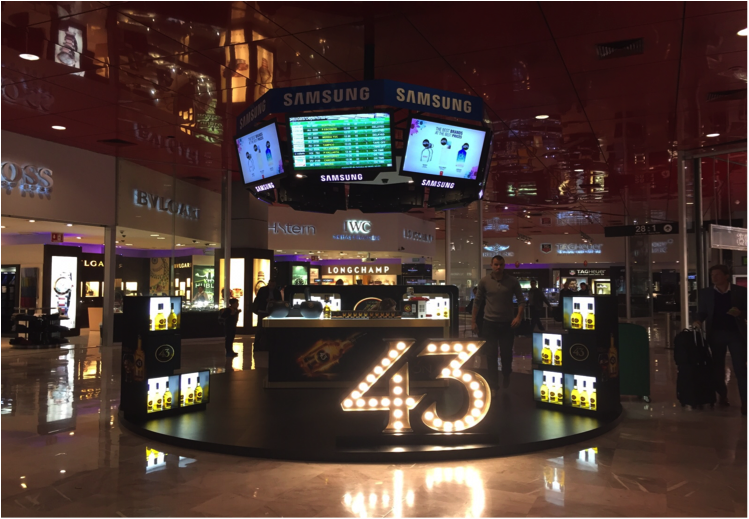 The Macallan Rare Cask Black is the second time in the last few months that EWTRA has had its brands featured at the Mexico City rotunda following a Licor 43 HPP bar with tastings for the month of October. “The rotunda in Mexico City is one of the most important flagship locations in the Americas for these high profile animations. We were fortunate, working very closely with Dufry, to get the rotunda twice this year, which is extremely rare. For us Mexico is a top priority market for Macallan, and Licor 43, because the brand is so big in Mexico. Those two brands have a strong focus in Mexico,” says Colombo. 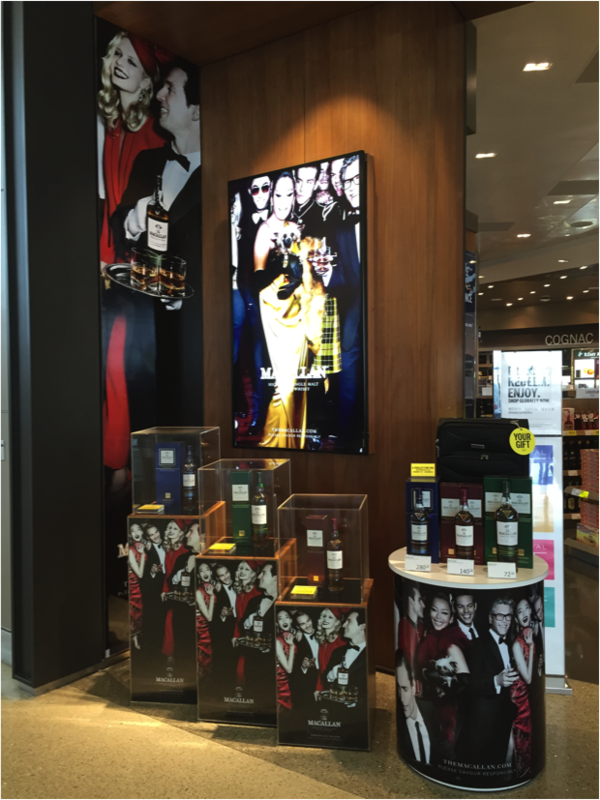 EWTRA featured Mexican favorite Licor 43 in the Rotunda at Mexico City Airport with Dufry in October. Despite some difficulties in Latin America led by Brazil, EWTRA’s business in the Americas has been positive in 2015. “Overall the business is strong. We are hitting our expectations. Macallan, our number one brand, has a pretty diverse consumer group. We are strong in Asia, in the United States and all throughout the Americas and in Europe. Brazil might be a little soft right now, but Argentina is doing fine. Our stores in the west coast of the US are doing well with Macallan. The US is picking up some of the slack from Latin America,” says Consuegra. Tito’s Vodka is another EWTRA brand that has been doing exceptionally well throughout the region. “Tito’s Vodka is on fire everywhere we put it. The biggest issue has been keeping it in stock. We’ve now been able to convince the retailers to give it better locations and more facings. Consumers see Tito’s in all the bars and bring it back as part of Americana. Tito’s is now the number one brand in on-trade in the United States. We are doing really well with Tito’s both in the duty free and in domestic Caribbean,” confirms Consuegra. Disaronno is also doing very well, says the EWTRA team, especially with its high profile seasonal bottle, which this year features Cavalli. “We are reactivating the brand in accounts where it had been delisted before we took it over. We are now back in DFA and International Shoppes, for instance,” says Consuegra. 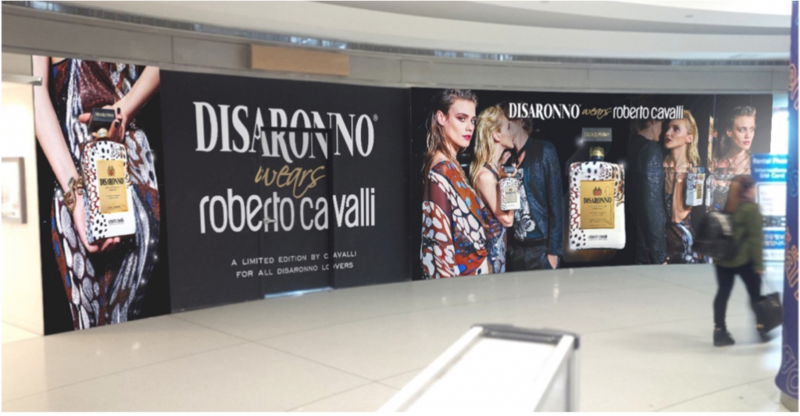 FASHION 4 DEVELOPMENT – Disaronno, in cooperation with the Maison Cavalli, is supporting the United Nations-sponsored Fashion for Development initiative. This marks the third consecutive year for Disaronno’s icon project, – which in the first two editions involved the collaboration of top-tier Italian fashion maisons Moschino and Versace. Once again ILLVA Saronno will donate some of the proceeds to F4D, which contributes to various humanitarian activities in Africa. Looking over the results of year one for the new company, Consuegra notes that the EWTRA brands are outgrowing the category in all its key markets. “I think we are ahead of the market in pretty much every market that we operate with our key brands. If the category is declining we are dropping less than everyone else,” he says.